Rip currents are found along most coastlines, and where they form near popular beaches they can be deadly. The journalist Decca Aitkenhead has written movingly about how quickly life can change after her husband was swept out to sea by a rip current while rescuing their son. A rip current (sometimes incorrectly referred to as a rip tide) is a strong, narrow, fast-flowing current directed toward the sea that travels up to one to two metres per second. Rip currents usually develop close to the shoreline in very shallow water around a metre deep – just where beach bathers are usually found. For rip currents to form, there must be areas close to the beach where some waves break and other areas where they do not. Usually this is caused by sandbars on the seabed that form from the sediment deposited by waves and tides. Waves are encouraged to break when travelling through the shallower water over the sandbars, but they don’t break when travelling through the regions of deeper water between them. As waves enter the shallow water they “shoal” – increase in height – and through their momentum they begin to force water towards the shoreline. Once the waves begin to break – so decrease in height – this momentum is reduced, opposed by another force known as a pressure gradient. This opposing pressure gradient causes the sea surface level to rise up by a few centimetres where the waves are breaking. As the surface level of the sea where the waves are breaking over the sandbars is slightly higher than where the waves are not breaking, a current forms from water that is essentially flowing “downhill” from where it is higher to where it is lower. These are called feeder currents, and where they meet between sandbars their flow turns away from the shore and becomes the strong rip current that travels through the deeper water. Waves break over the sandbars (1), feeder currents form moving parallel to the shore (2), until meeting and flowing offshore as a rip current (3). Rip currents are dangerous because they carry anything in the water seawards to deeper waters, and are not easy for swimmers to detect. In fact most bathers are not aware of the hazard they represent. A bather in shallow water is likely to drift with the feeder currents along the shore without noticing, at which point they may be carried into the main rip current. Very quickly, they are carried out to sea and out to depths where waves may break over their heads. At this point bathers frequently panic, often with tragic results. Those attempting to swim back towards the shore against the rip current will quickly tire as the rip will generally be too strong even for the most competent swimmer. While rip currents are caused by the action of waves they are also affected by the tides. Whether the tide is in or out will vary the depth of water over sandbars, effectively becoming a switch that turns wave breaking on and off as water depth rises and falls. In Britain’s south-west, for example, sandbars are frequently found around the shoreline at low tide. For several hours low water waves break over these bars and cause rip currents, but as the tide rises the water depth over the bars increases, the wave breaking stops, and the rips become inactive. This repeats over the twice-daily tidal cycle, and is also regulated by the fortnightly cycle of spring tides and neap tides, which gives rip currents a semi-regular pattern. 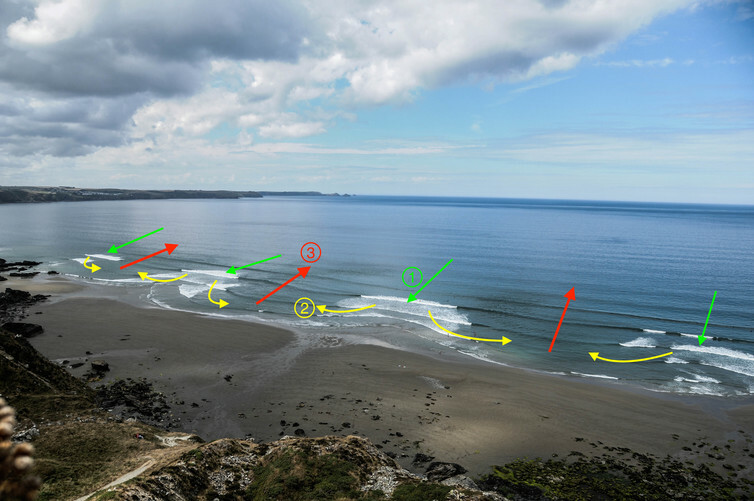 Rip currents can be identified using complicated instrumentation, GPS-equipped drifter floats, or even by releasing coloured dye into the waters around the surf zone. But a simple trick to spot rip currents is to watch for the patterns of wave breaking visible from the shore. Seen from a high vantage point such as a cliff above a beach, the contrast of intense white foam where waves are breaking versus the flat, dark waters of the rip current creates a characteristic pattern. In fact the same concept is used to identify rip currents using automated camera systems. It’s worth remembering though that, somewhat counter-intuitively, bathers should head towards the surf, and stay clear of the dark, flat water under which the fast currents lurk – even though it looks more inviting. And the safest beaches for bathers are those with a lifeguard, who are trained to recognise safe regions – their flagged areas and advice should always be followed. Martin Austin receives funding from the Engineering and Physical Sciences Research Council.